From DRAK’s Šípková Růženka (Sleeping Beauty). A little earlier this year I was apprised of the passing of a major artist unknown to a majority of the readers of these essays. And that I have been far too preoccupied by personal and pecuniary matters to address until now. And since the most I could find in English about him was a brief paragraph on the American site for UNIMA, and another small English language tribute in the Hradec Králové city website, where he had occupied his last years as the Deputy Mayor for Culture and Tourism, I decided I needed to write something myself. 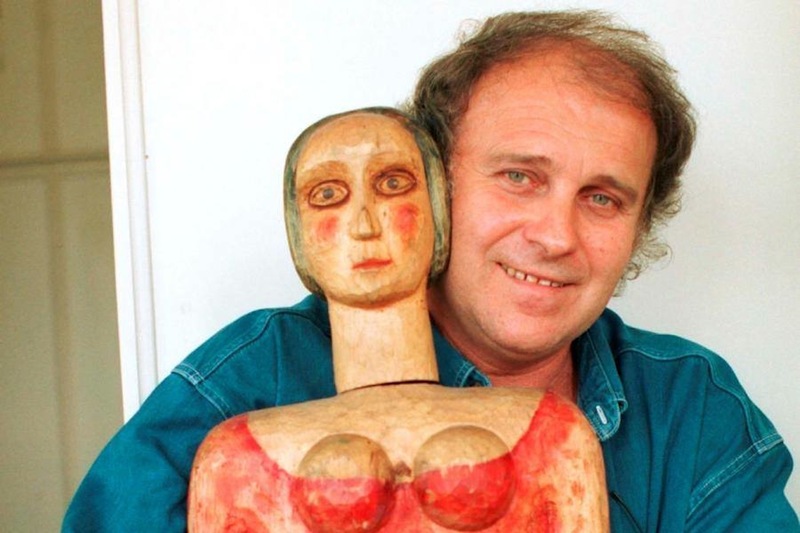 Legendary puppeteer, theatre director and teacher Josef Krofta died on March 18th 2015, he was 71 years old. And what it makes this personal to me is that back in the fall of 2012 he graciously consented to be interviewed for Gravity From Above after being presented to me by his son, Artistic Director at the Wrocławski Teatr Lalek, Jakub Krofta. I was extremely honored to meet him. And yet I felt like the interview needed to be redone at some point for technical reasons. Also because on the day of the interview I had to drift back to Prague to interview Jan Švankmajer I didn’t get to spend as much time as I wished with him. When I learned of his death I was immediately filled with many different emotions; loss, a tinge of regret and gladness that I has indeed gotten an interview at all. Now in the notes for my 2012 journey I didn’t write too much about him. On the page where his name appears I spent most of the time detailing my hunt for the squirrelly Švankmajer. But make no bones about it interviewing Josef Krofta was every bit as crucial to me. And in some ways more so. Švankmajer is in many ways a peripheral character in the Czech puppetry story, since his story overlaps into film and Surrealism. But Krofta is at the heart of puppetry in the post-1968 period, after the Soviet crackdown of the Prague Spring. Though decidedly not a political artist, Krofta is a member in full standing of the era of Havel and the Plastic People of the Universe. And deserves to be as well known outside of the Czech Republic. 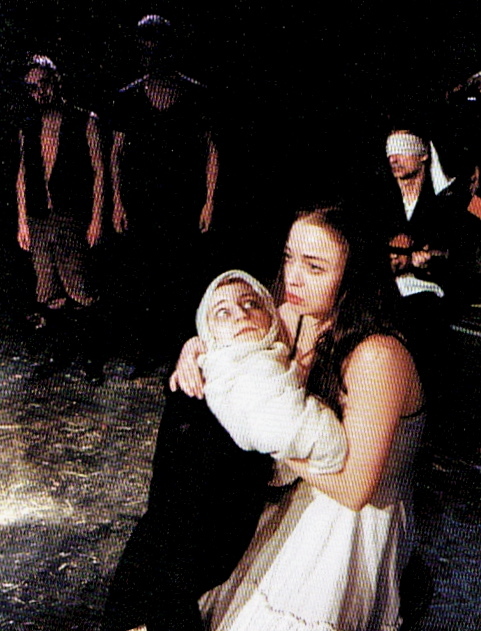 From DRAK’s 1998 production of the early modernist play Woyzeck. Born on March 30, 1943 in Uherské Hradiště in Moravia in the former Czechoslovakia Krofta did not grow up in a family with roots in puppetry, but instead was somewhat pushed into the field by the Communist government after studying at DAMU (Academy of Performing Arts) in Prague in 1965. Puppetry, particularly after 1968, was considered safe by the authorities, since they saw it as being largely for children. He worked at the State Puppet Theatre of Bratislava, and then at the Little Theatre of Ceské Budejovice, where his gifts as a promising director began to be noticed. In 1971 he was installed as Artistic Director at DRAK in Hradec Králové, where in one form or another he stayed until his last years. 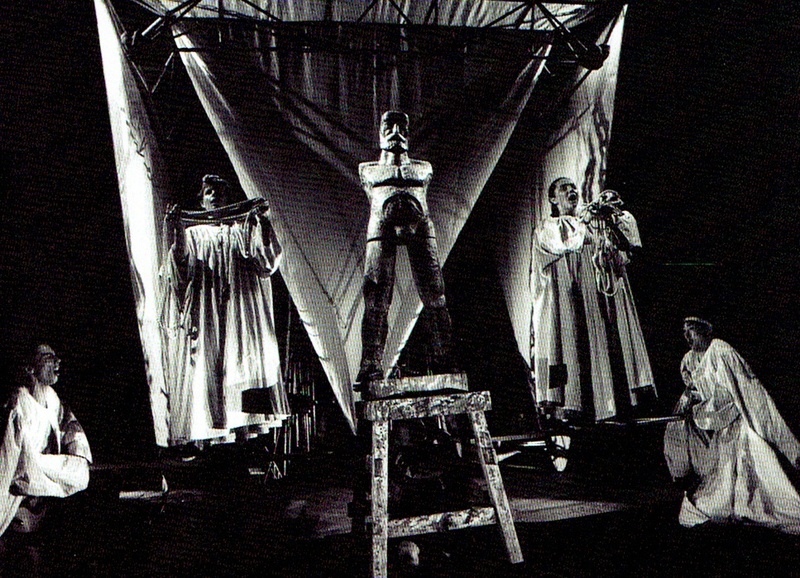 It was there that he developed a unique style of puppetry that had the actors interacting directly with the figures on the stage, without the need to hide the puppeteer. 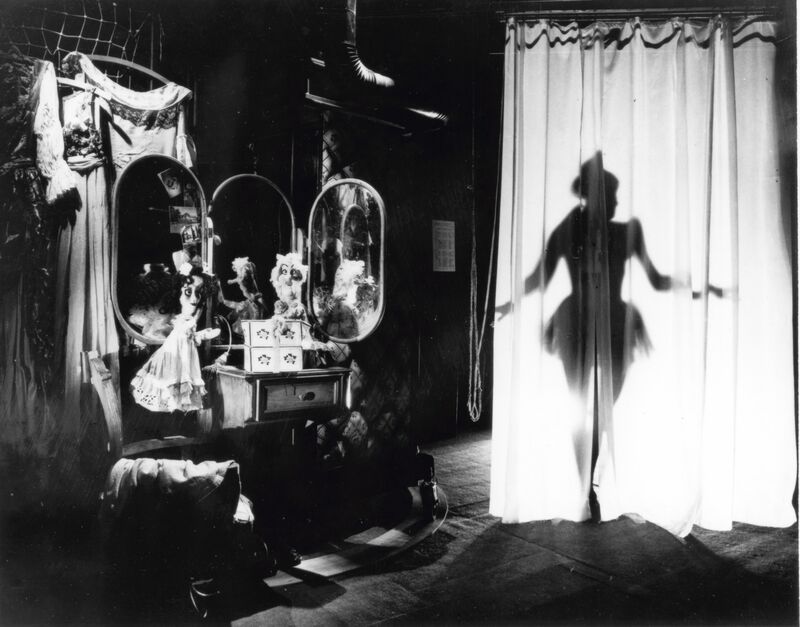 Later on he incorporated elements of Alternative Theatre and circus performance into the mix. Under Krofta’s auspices DRAK theatre performed a wide variety of plays that bridged the traditional and the modern including Pinocchio, Hamlet, The Beatles (The Czechs have a kind of fetish for the Fab Four. ), Don Quixote, The Tower of Babel (It was images of this production that inspired our Reckoning Motions production of The Great Ziggurat. ), The Three Golden Hairs of Old Know-it-all, the Little Mermaid, Hansel and Gretel, Cinderella, The Bartered Bride, Goldilocks, Orpheus, the Three Musketeers and the Kalevala (the Finnish epic). Krofta prided himself on never doing a show that was simply for adults, yet adults certainly came regularly to DRAK. But he felt a real responsibility to nurture the imagination of children, especially as it was being assaulted from all sides with either propaganda or with hollow commercialism. DRAK’s 1993 version of the biblical story of The Tower of Babel. In 2005, on my epochal puppet journey, I saw his version of a play called “The Enchanted Bagpipes”, the story of a Moravian bagpiper, ably performed by cast member Filip Huml, with a Moravian bagpipe, an instrument resembling the Irish uilleann pipes. The story is about a man tempted to sell his bagpipes for power, or through fear, or for riches. It is clear that the pipes represent the Czech soul. And the temptations are the Austro-Hungarian Empire, the Communists and American commercialism. All the while there are costumed devils and strange figures in the mix. 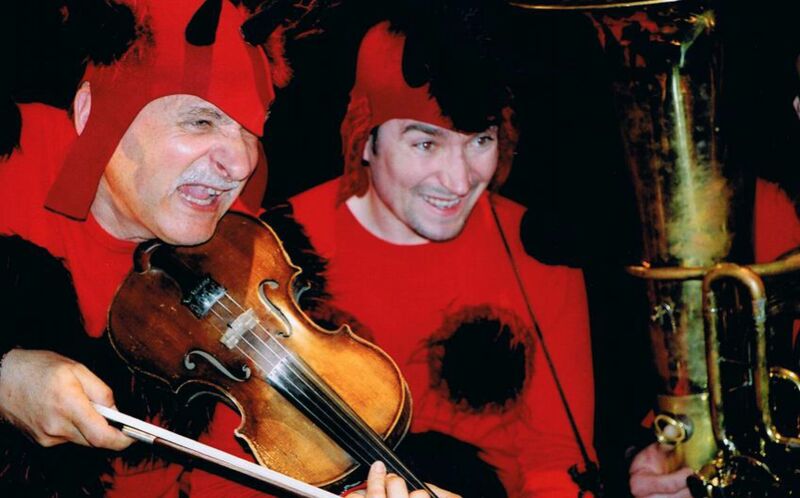 It was clearly an allegorical tale, which I saw played to ecstatic applause by a large group of children at the Divadlo Minor (Children’s Theatre) in Prague. And in a way this was typical of Krofta’s mix of simplicity and depth. Filip Huml’s Moravian bagpipes become a representation of the Czech soul in Krofta’s The Enchanted Bagpipes. During the depths of Communist era especially towards the late Eighties as a whisper of freedom crept into the Czechoslovak culture, people flocked to puppet shows in DRAK because they were sensing hidden messages that both were there, as a dragon oppressing a village could easily be interpreted as the Russian pressure on the much smaller Czechoslovakia, and weren’t there. Krofta said they had come to a version of Romeo and Juliet desperate for secret allegorical meanings, while Krofta maintained that it was truly about love. And yet many little messages were indeed smuggled through the rather humble, unguarded door of puppetry. And yet much to his credit Krofta balked at making propaganda, even anti-Soviet propaganda. He told me that he felt that politics and art didn’t really mix. Now I think there are human truths in Krofta’s best work, that do indeed carry political implications from time to time, yet he remained determined to avoid the propagandists role. This after a lifetime under the authoritarian thumb of the Communist Empire. A lesson we could do well to learn ourselves. Krofta became a member of the executive council of the international puppetry organization UNIMA from 1992 – 1996. He also was a guest teacher at the International Puppet Institute in Charleville-Meziérès as well as the Theater Academy in Frederikstat in Norway. He also was a Professor at DAMU in Prague. Through DRAK he also participated in a co-production with a Japanese puppet company entitled A Plague On Both Your Houses!, a variation on Romeo and Juliet. By any measure Josef Krofta was a major figure in puppetry in the 20th Century. His influence was felt both in the Czech Republic and the world. He will be missed as far away as Alaska. This entry was posted on May 21, 2015 by The Anadromist. It was filed under Art, Czech Puppets, Czech Republic, DRAK, Gravity From Above, Jakub Krofta, Jan Svankmajer, Joseph Krofta, Prague, Puppet Documentary, Puppet Film, Puppetry, Romeo and Juliet, Shakespeare, Symbolism, Theatre and was tagged with Charleville-Mézières, Czech Puppetry, Czech Republic, Documentary, Europe, European Travel, Gravity From Above, Hradec Kralove, Jan Svankmajer, Josef Krofta, Prague, Puppet History, Puppets.